 Set the oven to 230°C Fan and place a tray in the oven to get hot.  Put the flour in a bowl (mixer with dough hook if you have one otherwise use a fork) and add the yeast to one side and the salt on the opposite side.  Add the black onion seeds and mix all together quickly.  Add the water and oil and mix until all the flour has been absorbed.  Tip a little oil on to the work surface and tip out the dough, knead until you have a smooth ball, about 5 minutes.  Place into a lightly greased bowl, cover with a clean cloth and leave to prove until the dough has doubled in size – about an hour and a half.  Tip out the dough on to a surface lightly dusted with flour and knock back by kneading for a couple of minutes.  Forms the dough into 6 equal size balls then roll each one into an oval about 1cm thick. 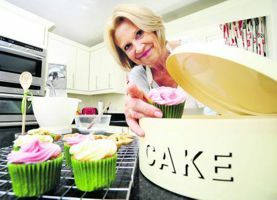  Take the hot tray from the oven, lightly dust with flour and place the ovals on it – you may need to cook in 2 batches.  Bake for about 10 minutes until the breads are puffed up and just light brown. Remove from the tray and cool. Cook any further batches the same.  Char grill the chicken fillets by placing them in a polythene bag along with the oil, rosemary and garlic, shake until thoroughly covered.  Place on a griddle or in a pan and cook for 4 to 5 minutes until cooked through and golden. Remove and cool.  Mix together the salad leaves, cubed avocado, sliced pepper, dressing and parmesan shavings.  Cut the cooled chicken into pieces about an inch long and add to the salad. 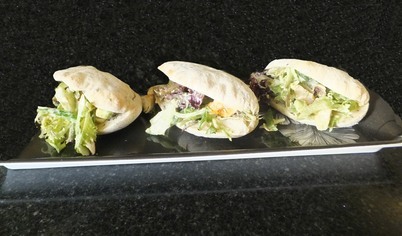  Slice open the pitta breads on one side and fill each with the Caesar salad.